Bispecific antibodies are artificial proteins that have promising applications in the field of cancer immunotherapy. They are comprised of two monoclonal antibodies held together by a flexible peptide linker. As the name suggests, this makes them able to bind to two different antigens. 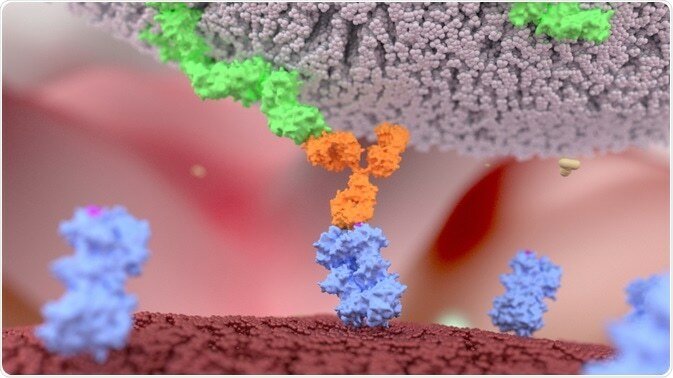 There are currently three different types of bispecific antibodies under investigation: trifunctional antibodies, chemically linked Fabs, and bispecific T cell engagers (BiTEs). Each of these antibodies consists of two variable light chain domains, of which one can bind to a cancer cell, while the other is designed to bind to a T lymphocyte antigen; thus enhancing the immune system response against the cancer. Trifunctional antibodies additionally contain an intact Fc region which binds to another type of cell (that expresses the Fc antigen), such as the macrophage. Currently, most therapeutic antibodies are monoclonal antibodies (moAbs), which bind only to the target protein. Monoclonal antibodies have a single Fab region that binds to a cancer cell and an Fc region that cannot bind to a T lymphocyte, since there are no Fc receptors on T lymphocytes. The added second Fab region enables bispecific antibodies to recognize and bind both cancer cells and cytotoxic T lymphocytes. Bispecific antibodies therefore confer an advantage over moAbs, as they are able to interact with T cells in addition to the protein of interest and intiate an immune response. Bispecific antibodies act as a bridge between cancer cells and cytotoxic T lymphocytes. They bind CD3 antigens on CTLs and a specific antigen on cancer cells (e.g. CD19), which in turn activates the T cells and promotes the lysis of cancer cells. It is important to note that bispecific antibodies only work when both sites are occupied by specific cells. Since they are characterized by very high specificity, this minimizes potential unwanted side effects. Moreover, these antibodies can activate T cells directly without the need for additional co-stimulation from other immune system cells, including the class I MHCs which are normally involved in presenting the antigen to CTLs. Bispecific antibodies are currently approved for the treatment of Philadelphia chromosome-negative relapsed or refractory acute lymphoblastic leukemia in the United States. Clinical responses have been reported at very low doses in patients with non-Hodgkin lymphoma as well. Side effects of treatment with bispecific antibodies include: mild inflammatory response due to the T cell activation, and cytokine release syndrome which occurs in response to the release of inflammatory cytokines (IL-1, IL-6 and others). Other common adverse effects of therapy are fever, lymphopenia (low lymphocyte count), increased C-reactive protein (CRP) count, as well as neurologic findings. A number of different bispecific antibodies are currently being researched and developed. Their ability to recognise and activate very specific effector cells and responses of the immune system against cancer cells holds great promise as therapy in the future. Yuraszeck T, Kasichayanula S, Benjamin JE. Translation and Clinical Development of Bispecific T-cell Engaging Antibodies for Cancer Treatment. Clin Pharmacol Ther. 2017;101(5):634-645. Huehls AM, Coupet TA, Sentman CL. Bispecific T-cell engagers for cancer immunotherapy. Immunol Cell Biol. 2014;93(3):290-6. Sedykh SE, Prinz VV, Buneva VN, Nevinsky GA. Bispecific antibodies: design, therapy, perspectives. Drug Des Devel Ther. 2018;12:195-208. Published 2018 Jan 22. Ross SL, Sherman M, McElroy PL, Lofgren JA, Moody G, et al. (2017) Bispecific T cell engager (BiTE) antibody constructs can mediate bystander tumor cell killing. PLOS ONE 12(8): e0183390.